As an alternative to the BMW 3-Series, the Infiniti G-Series has proven quite capable in both sedan and coupe forms. This year Infiniti broadens its successful G37 line to include a convertible model. The convertible is a power-operated retractable hard top that operates in about 20 seconds. When open, the three-piece hard top is stowed out of sight under a hard cover leaving the lines of the car unspoiled. With the top closed, the hard top promises better shelter during inclimate weather. The convertible shares its 3.7L V6 engine and 7-speed automatic with the G37 coupe and sedan. With a starting price of $44,000, the G37 coupe has a healthy list of standard equipment including leather seating and HID lights. With option packages, the G37 approaches $50,000 fully loaded. 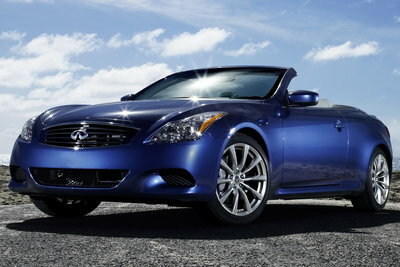 The Infiniti G37 Convertible is an all-new model featuring a 3-piece folding hardtop. The convertible is longer and wider than the coupe.